These extraordinary pictures are by Caroline Fellowes, an artist who lives in France but is represented by a gallery in Derry, in Northern Ireland. They are wonderful things, and I post them today because they happen to sit right in the middle of a number of conversations I seem to be having with increasingly frequency of late. Fellowes’ series here is made to face a perennial challenge in photography — one which I have approached from different angles on this blog several times in the past. Fellowes’ pictures (they’re called Animal Vegetable Mineral) record the marks made on her windows by a number of different agencies: heat, plants brushing against the glass, cold, limescale, water, the tracks of various kinds of animals, fingers… Naturally, they are visible only in certain lights, at the right angles, and for a particular time. They come and go, too: smear marks in condensation today will re-appear in tomorrow’s condensation, even though they seemed to have gone when the pane was dry. Not only are they photographs in fact — beautiful fancy digital prints on water-colour paper, since you ask — but that temporary quality makes them wholly photographic in conception, too. So much photography is about seizing what will not otherwise stay, or seeing what cannot otherwise be seen. Yet the pictures in Animal Vegetable Mineral are in one other important sense antithetical to core photographic values, too. These take great store by the business of mark making which is normally absent in conventional photography. To that extent, they have more to do with painting, and indeed Fellowes is a distinguished painter as well as a photographer and knows very well what she’s about in that regard. In Fellowes’ AVM series, the marks are made by outside forces. I believe some of the footprints are of frogs. In other work the artist often makes them. My colleague at the University of Brighton, Johanna Love, gave a brilliant seminar presentation on these kinds of ideas the other day. Love is a print-maker in various different kinds of process (including photography). She’s interested in the variety of marks that can intervene even in a carefully controlled sequence: she has photographed pencil markings at huge magnifications to see the landscape of pits and peaks which make hand-made marks so attractive. She draws on photographs and likes the way that when the light strikes the greasy pencil markings you can’t see the print beneath. She grew interested in the dust that interposed itself between scanner and subject if the subject was raised a little from the scanner bed — until that dust could itself be a legitimate subject. She had tracked the antecedents of some of this thinking in close detail: I’d not come across an interesting book of Xerox ‘drawings’ she mentioned by Ian Burn, for example, in which the marks are the marks of the process itself. When she referred back to Duchamp and Man Ray in regard to dust, I was on familiar ground. She made a lot of reference to Helen Chadwick, whose combination of machine-made and hand-made was absolutely pioneering. Shade and Darkness – Evening 1983. From the series Traditional Landscapes. Not long before that I took part in a round-table discussion at Somerset House, one of a series leading up to the PhotoLondon fair in May 2015. It was led by the artist Ian McKeever. His title? Against Photography. He meant it in both senses: against meaning leaning against or next to, as well as counter to or opposing. McKeever with impressive articulacy laid out some of his own trajectories to and from photography. McKeever is a wonderful painter, taking as much pleasure in the physical acts of painting as he does in any communication that results from it. The discussion was driven mainly by a very fine publication (half-way between catalogue and monograph, the first of a new series called Imprint) produced by McKeever’s gallery, HackelBury, in West London. McKeever was outspoken in some of what he had to say. He has no doubt about the intrinsic primacy of paint over photography as a vehicle for thought. Given that he is a long-time and highly skilled practitioner of photography (and one who has written on it very well) I was surprised by how categorical he was. But he was, and mainly because of the fundamental importance to him of making marks. He had other arguments: he stressed that painting takes time and that time allows the painter to distill thought into the artefact, something that cannot be done at the 125th of a second at which photography operates. “A photograph”, said Ian McKeever that day, “is at its maximum position at the very moment it is made. [Afterwards] it can only ever be less than that…so a photographer is left with a dilemma: how to extend the language. The painter has a year or two in which to inflect meaning into what he’s doing. The question becomes how does the photographer bring that to the photograph?” And McKeever’s answer, clearly felt, although never in fact stated outright, was that he can’t. It was a terrific performance, and compelling. I remain unconvinced, I must say, by this notion of painters ‘inflecting’ meaning into what they do. They’re supposed to, sure enough. But many inflect only their own interest, their enthusiasm or their patience. If the formal instant of making ( or taking ) a photograph is too short to allow for much of that, the ancillary processes, of editing and arranging and printing in different ways allow for just as much. At one point McKeever contrasted painters trying to slow the world down against photographers trying to speed it up. The surfaces of photography are – I have written it before ­– skiddy, slippery. The eye tends to bounce off a photograph, having seized what quick meaning it can on the way. I’m not sure conventional photographers try to speed the world up – but they certainly make objects which are consumed at lightning speed. Photography is very good at making posters. One message: get it, and go. Contemplation, a combination of multiple meanings or the enjoyment of multiple – maybe even contradictory – sensations are not readily included in that. My own take on it is not quite so simple as a direct contrast between the marklessness of photography and the richer textures of paint or other systems which reveal the hand of the maker. Gerhard Richter worked all around this question: he did blob paint on the surface of photographs, with wonderful effects on each, but it was not his only solution. Lots of photographers have found ways to build illusions of depth or surface texture without any physical lilt to the surface at all. It has been one of the challenges that photography has faced best and longest. Montage, double-exposure, collage: all of those can do it. Part of the problem is that photographs are so often reproduced and that somehow we don’t think that makes any difference. See a Monet reproduced and you know that you’re seeing a shorthand version of the thing. A re-photographed John Stezaker will have an unbroken surface throughout. The ‘originals’ of such things as his have physical shifts to the surface: jumps and cuts and bumps and ruts where one surface meets another or overlays it. Such pieces are very often re-photographed. Sometimes they lose a lot, sometimes they don’t. The dioramas of Sohei Nishino definitely lose something in their re-photographed editions. The whole point is that they were not made by a single glance. Seen as hundreds of little views, they compete to tell their little stories, but also add up to more than the sum of their parts. They’re like a mediaeval map, slipping from one perspective to another, jumping from middle-distance to near and from scale to scale. Seen as a single slick carpet, they lose a lot of that jostling energy: they become more like a page of results from a Google image search, flat, with less connection from one picture to another. I’ve written before about Jorma Puranen’s wonderful series of old masters – Shadows, Reflections and all that Sort of Thing – in which the slicks of light that get in the way of seeing the whole picture all at once become themselves a subject. Puranen reflects on reflection. His fellow Finn Santeri Tuori does something parallel when he builds up his skies of dozens, maybe hundreds of layers piled up electronically, in imitation of the hundreds of thousands of separate condensation events that go up to make each cloud. Puranen’s series works all right in reproduction, and therefore on screen, too. Tuori’s makes almost no sense unless you can see the print itself. Elsewhere, but still on this blog, I wrote about the marking James Newton found on the backs of Ford Transit vans (and – credit where credit’s due, it was pointed out that Adam O’Meara had done something pretty similar before). Miles wears T-shirt and Sweater by Galliano. From Dazed and Confused, 2011. It’s a picture whose entire appeal comes from Anzeri’s work. He’s done it many times to just as good effect upon pictures picked up more or less as junk. All those other people are hitching a free ride on that one person’s work. Calum Colvin has been working his whole life at a lovely waltz between two dimensions and three. Much later Maurizio Anzeri and Julie Cockburn are doing something connected to that. I’ve argued that the whole Pictorialist tendency contained at root a kind of campaign for viewers to be held longer on the surface of photographs than has been the norm in news, or advertising or topography or any of the one of the dominant zones of photography. Maybe it was not always mark making, but certainly mark-imitating. Interesting surfaces will do, if you can’t have marks upon them or seemingly upon them. Anything which counters the tendency in viewers to see a photograph as a single rectangular frameful of information can help to slow the viewer’s mind within a photograph. Come to think of it, I suppose that’s what’s at play with a really fine print, too, even if it has the most traditional surface, acting merely as a window does. A great print has depths. It gives to the view it contains a quality which I can describe only as ocular weight. That’ll hold you there a while. We all know the feeling of finding a really great print more interesting than the scene within it. Reproduce it, in print or online, and that is destroyed. Tacita Dean’s Russian Ending – a series I keep coming back to and which has slowly crept its way up my own internal league tables of photographs – has lots of things about it, but in this context it has both the careful ( and appropriate ) attention to surface (they’re photogravures) and the hand-written notes apparently carved into the surface. They are layered intellectually, seemingly physically, too; they’re even layered as narratives or pseudo-narratives. You may or may not like them as much as I do, but you won’t just glance at them and go. That is the challenge for photographers. I’m coming around to thinking it a far more central challenge than I had realised. If you’re a jobbing photographer or a craftsman or a ‘professional’ or what I have begun to think of as a camera operator, you want to make crisp clear messages that are simple and linear. Those can be grasped as quickly as you like, and their surfaces can be slick. Christiano Ronaldo scores a goal. The graduating student in a rented gown. No complex messaging needed, or even welcome. But any photographer who wants to send out more complex messages has to find a way to keep the eye of the viewer on the surface of that print for longer. That’s what every single one of the people here is doing. It’s plain. A photograph which offers no solution to the problem of the eye sliding off it will never be capable of transmitting very sophisticated or complex messages, however much its maker tries. Solve that, in whatever way that you can, and a photograph can bear as much ‘inflected’ meaning as any other medium. But since that eye-retaining or eye-detaining surface is so much at risk in reproduction, it becomes easy for an Ian McKeever to say photography can’t do what other systems, more recognized for mark making, can do. There have been hundreds of solutions. I wrote once about Michael Wolf’s Tokyo Compression series, in the best of which the condensation on glass acts as a surface, which is readable two ways: metaphorically, it looks like the spirit of the crushed commuters, weeping and seeping out. Practically, it reminds us that tropical climates are physically hard to endure. At his best, Richard Learoyd achieves with his hand-built cameras an incredible trick of imitating the act of looking very hard. He seems to make pictures which have peripheral vision built into them, as if he had already committed you to staring at the bits he cared about. Katerina Jebb achieved something similar by a wholly different technique in her show at Arles in 2014 – when she found depth of field enough by using a hand-held scanner to move around her sitters, making a sort of haze of doubt which became a haze of wonder. David Hockney spoke very clearly in his Bradford lecture long ago about how his Joiners imitated the staccato jumping of the eye within the frame that is standard in paint but rare in photography. Indeed, he has gone on exploring that same idea for many years; the gridded-videos moving down the lanes in East Yorkshire do much the same thirty (or whatever it is) years on. Even with no such complexities of surface, a photographer can do things with composition itself to hold the eye in place: the classic example would be Josef Koudelka’s panoramas, which seem almost to build a maze or circuit of blocks of darkness that we cannot pass except in an order chosen by Koudelka. But a panorama is peculiar anyway: it is rarely possible to see a whole panorama at once: the shape itself holds the eye there a while. Friedlander’s tour-de-force pictures through (and of) car windows do it in a completely different way. It may be that one of the reasons we ( or certainly I ) enjoy battered old photographs is wrapped up in this same connection. A picture, which shows upon itself the marks of how it got to be what it now is, has acquired another layer. That layer may be no more than survival: but that’s not nothing. Even a trivial survivor has absorbed a certain amount of time. That’s what we mean by patina, and it’s partly why the myriad examples of re-mining or repurposing old archives going on at the moment are so interesting: old vernacular has depth, just by dint of that battered surface. Sooner or later photographs will become rare as physical objects. On screens, photographs never have those marks: unless … somebody has put them there on purpose. And that’s where we began. It’s not really about mark-making as such. It’s just making marks or finding ways to imitate them is one of the very best ways to keep the eye of the viewer where you want it. And once you’ve done that, you can begin to say whatever it is you have to say. But you’ve got to find a way to keep the viewer from sliding off your photograph. 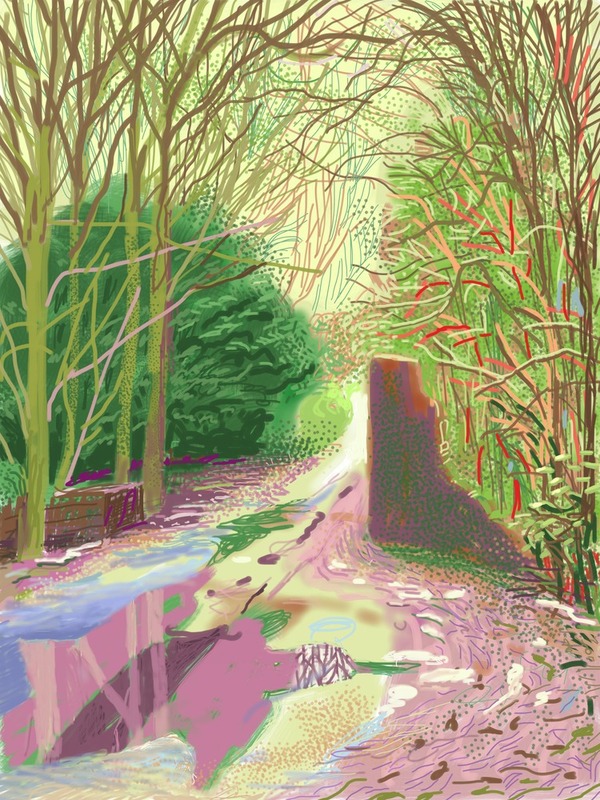 There is a considerable buzz in London about the David Hockney exhibition, recently opened at the Royal Academy. As things stand at the moment, the show is sold out. There has been tiresome burbling about how amazing it is that a man in his 70s can master an iPad. It is more remarkable that the Academy offered him the show before most of the paintings in it were made, and that far from being a retrospective, it is in effect a huge new commission. For sheer drive and the enjoyment of making pictures, this is what a major Academy show should be, a great gift to the nation. I want here merely to note one aspect of it which has not quite been given the prominence it deserves. Hockney would not thank you for saying so, but he is in fact one of the most inventive and technically able photographers in Britain. Not only that, but he has been a brilliant and inspiring theoretician of photography, too. Nobody has been less scared of new technology. He has made pictures in Photoshop, with faxes, on iPhones… He even used the Bradford Telegraph and Argus (reckoning the particular rendering of the printing presses and newsprint gave their own feel to a piece distributed within the paper to its readers). Until fairly recently, if you wanted to use new technology to make pictures, it would likely have something to do with the photograph. For all that many of the new pieces are made on iPads, they are not made using photography. 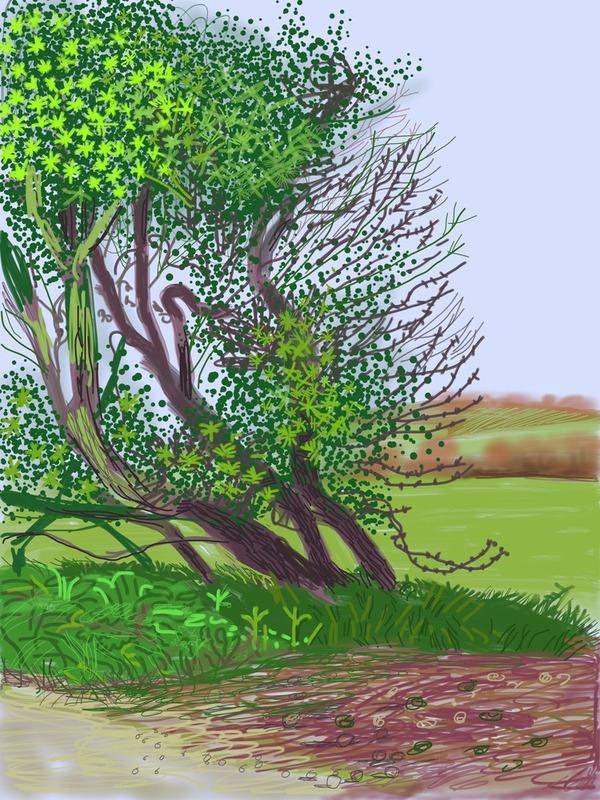 Hockney has certainly bent the technology to his will once again; his iPad has become a portable painting set, ideal for outdoor use. But I sense that his pendulum has swung back from photography. In his book Secret Knowledge – for all the brilliance of its thesis, and for all the enthusiasm he plainly had for it –he had overstated his case for a certain kind of photographic way of seeing. Now he’s on the retreat from that. The highlights of the Academy show are the series, 36 watercolours when he first came back to Yorkshire, then small oils, then the great Woldgate series of iPad drawings. None of them owes much to photography. When iPad work is exhibited on iPads, it appears backlit – a successful presentation which is on show at the Academy. Although not much painting has been backlit since stained glass, it’s hardly a new discovery in photography. Note that most viewers will be reading this on a screen, and therefore seeing the images backlit, too. But when iPad drawings are printed on paper, they appear on a surface which has no real merit of its own. Those parts of an iPad drawing which have no marks somehow remain just space, inked as a wall can be rolled in a flat colour. They don’t define the marked areas which adjoin them. They act as deadeners, areas that take some looking at but give nothing back. You can see Hockney wrestling with this in the busy-ness of his work on iPads. He is constantly adding new ‘layers’, working with many different shapes of splodge (can one really call them brush-strokes when no brush was involved?). These layers are interesting in themselves, and viewed from distance, the tremendous liveliness of the iPad drawings is partly down to that very complex structure. But move in close and all that vanishes. The surfaces are matt, dull, unenlivened. They are printed on computer equipment designed to print photographs. The surfaces of the simple papers used (are they Epson?) simply can’t hold the eye, and we are back where we started. Although not photographs, these things fail to provide stepping-stones for the eye (and hence for the mind) just as photography so often fails to provide them. For that reason – and this makes it somehow worse – they succumb to precisely that problem that Hockney, perhaps more than anybody, had identified in photography and found solutions to in the joiners. The great failure of the Academy show is the Yosemite series from iPad sketches. They’re mammoth prints, but with no sensation of space other than the natural perspective of the views. They are made of six butted papers each – they must be twelve foot tall – but even that is just a residue, an evolutionary survival of the grids that Hockney has used so brilliantly in the past. They’re printed on the same dull surface as all his other iPad works, only at this scale the dead surface of the plain areas of ink on paper shows up worse than ever, much more than in the Woldgate pictures, as a terrible underlying denial of the beauty of the lines and shapes of the artist’s own work. In the iPad drawings from Yosemite, Hockney has pushed his new medium just that little bit too far. By contrast, there is a sketch from a large sketchbook (Blossom, May 25 2009, pp. 7&8) which is a dark hedge, clearly of several different species, seen across a white field punctuated only by a few calligraphic lines. Not only is it wonderful, it’s wonderful in the old-fashioned way that no camera could ever match. This is quite telling. The Grand Canyon photographed joiner, which is in the show, was a technical and imaginative miracle when it was made, in the mid 1980s. But it’s obviously faded, now. You can see Hockney pushing on so fast that even something as radically exciting as that, with its almost violently original treatment of space, is old hat to him. He may even wonder what all the fuss was about. As recently as his Annely Juda show in London in 2009, photography was still visibly behind much of the new work in East Yorkshire. In the entire Academy exhibition, there are fewer photographic elements than Hockney has shown for a very long time. Yet even as he seems decisively to be moving away from photography, in these gridded films he has once again moved photography on another notch.